Drivers of the world, here we are ! After another record-breaking 2018 SWS season, we have issued the final national quotas for the 2019 edition of SWS Finals. More and more countries are joining the series and the event becomes again more international ; which explains a couple of quota modifications from the estimate which was presented in October 2018. We can’t wait to welcome all these talented drivers in Valencia (Spain) from 11th to 13th July 2019 ! 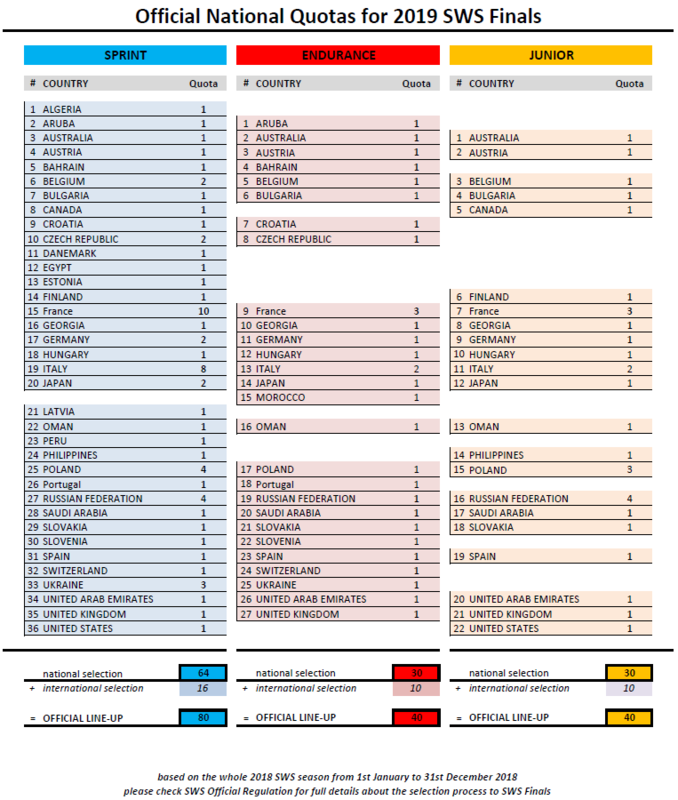 You can see below the final official list of national quotas which completes the direct qualifications from the International Rankings (see also the Official Regulations for the detailed process of qualification). Don’t forget that drivers & teams must comply with the rules to qualify ; especially having participated to at least 3 SWS events on their home track during 2018. On Friday 18th January 2019, your SWS home tracks will receive an email to confirm the qualified driver(s) / team(s) registered on their track. If track does not receive this email, it means no driver / team from that track has been able to qualify for the event. If you have further questions about the qualification, you can contact the SWS team via email : contact@sodiwseries.com. Next week, we will publish the list online on the SWS website. Finally, the official registrations will open in March 2019. In the meantime, we will publish some news about the event such as a driver book and a first provisory schedule of the event.